LaserShark (TM) is a high-end, high performance laser based underwater imaging system capable of depicting the seabed and objects on the seabed both with grey level images as well as a 3D profile. Acquired data from the LaserShark system can be presented in different way as this animation illustrates. 3D colour plots, 3D grey level plots as well as 3D models with grey level texture. Data can of course also be presented as "flat" grey level images. Green laser with a very high optical output and state of the art laser safety features. Solid state laser with a long lifetime. Custom designed camera optics, wide field of view and large aperture to collect as much light as possible and at the same time maintaining ultimate resolution and contrast. Custom designed camera electronics with onboard signal processing in hardware giving ultimate data rate and highest possible line rate. Custom designed laser power supply to allow for a compact laser unit. The system consists of two main parts, the laser and the camera unit. 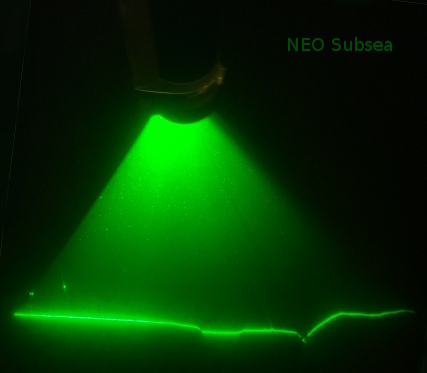 The laser projects a laser line onto the seabed i.e., a laser fan or a "sheet of light". This technique is often referred to as "sheet of light imaging". The laser fan is typically perpendicular to the seabed. The camera is located a certain distance away from the laser and the camera depicts the intersection point or line between the laser fan and the seabed. With a specified angle of the camera and a known distance between the laser and the camera it is possible to calculate the position of the seabed along the laser line based on the image data. This is done analysing each column of pixels from the image sensor. We will look for the position in each column where we find the maximum light intensity. That position will normally be the position of the laser line in the image. This gives a profile line of the seabed. While moving the system relative to the seabed and taking exposures, i.e., generating lines and putting them together, it is possible to generate a 3D surface model of the inspected seabed. OK, that gave us the 3D part. The grey level image is next. If we also store the light intensity in each image column where we found the maximum intensity, we get the grey level value for each column. This way we have fully synchronised grey level and 3D data. Illustration showing the principle of operation of the LaserShark system. To get a suffient range of such a system one needs a laser with a high optical power output. It also needs to have a laser wavelenght (colour) that has good transmission in water. And the laser needs to have a good power efficiency to be a useful tool on AUV systems that rely on battery power. And it needs to have compact design compared to the actual optical power. The LaserShark system fulfills all these criteria. This picture shows how the laser line looks in real life. One can see that the seabed has different heights along the laser line. This picture shows the main components of the LaserShark system. The camera lens is custom designed. It is a wide aperture lens (small f-number) with a relatively large field of view in water. It is optimised for the laser illumination source giving excellent resolution and contrast. It can be delivered with daylight block filter as an option to allow for shallow water operation. 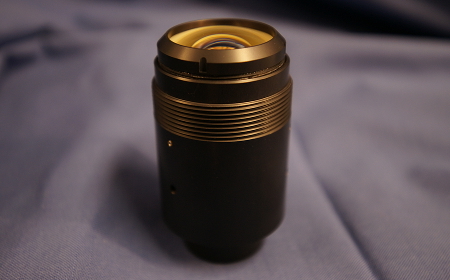 Picture of the custom designed lens for LaserShark. Version without daylight block filter. LaserShark (TM) is a trademark of NEO Subsea AS.